Vandemere Creek landing There really isn’t too much more you can ask for; A waterfront community that truly has deepwater with access to just about everything. Vandemere Creek landing is close to the Intra-Coastal Waterway (ICW) and approximately 25 miles to the Atlantic Ocean. 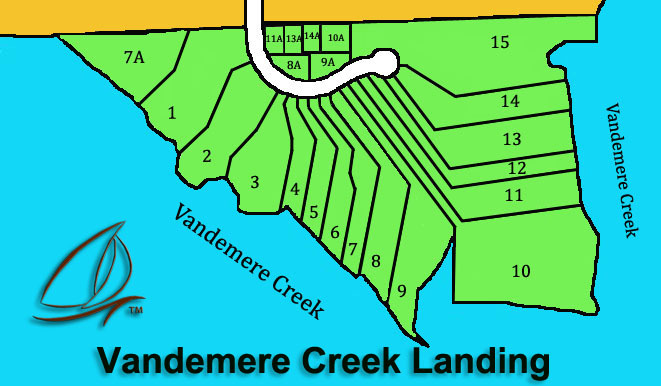 Vandemere Creek Landing is only 30 minutes away from New Bern and Oriental, NC. Vendemere Creek empties into the mighty Bay River. Both are famous for fish catches such as speckled trout, red drum, tarpon, flounder, shrimp and crabs. The area is blessed with an abundance of wildlife such as white tailed deer, marsh rabbits, squirrels, herons, ducks and geese. All utilities at Vandemere Creek Landing are underground. County water is available with each property on its own septic system. The community is covered with a protective covenants to insure its natural state. Vandemere Creek Landing is in-line with the Inner Banks Living practice of submarket pricing of waterfront property. Vandemere Creek large waterfront lot (deep water with a long range view) prices start from $159,990. For maps, directions, prices and more information contact us today.